You are here: Home / Diary / I’m an Excellent Cat Writer! I’m an Excellent Cat Writer! I am so excited! Every year, the Cat Writers’ Association has a contest and mostly humans who write about cats enter. This year, my human entered a couple of my stories… and they each earned a Certificate of Excellence! That means that the judges gave my stories high scores and I get a certificate. It also means I’m a contender for the Muse Medallion in my category, which is given to the top scoring story. I explain in this story how kitties get bored, and what humans can do to give us a good time and keep us from having to make our own fun. (For some reason, humans get upset when we do that.) If you haven’t read the story, you can do so here. 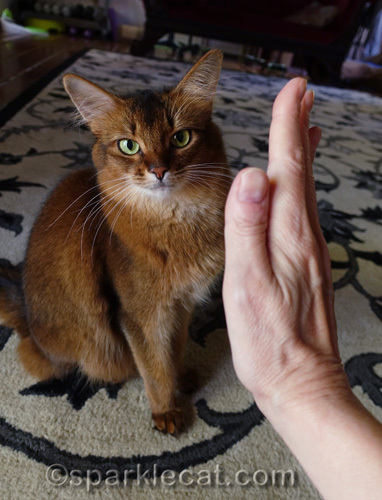 In which I show how kitties can learn several basic tricks… and earn treats in the process! This story is here. They are both in the “Online Article: Behavior and Training” category, so they are up against each other. Also I’m competing against my human who got a Certificate of Excellence for one of her own stories. 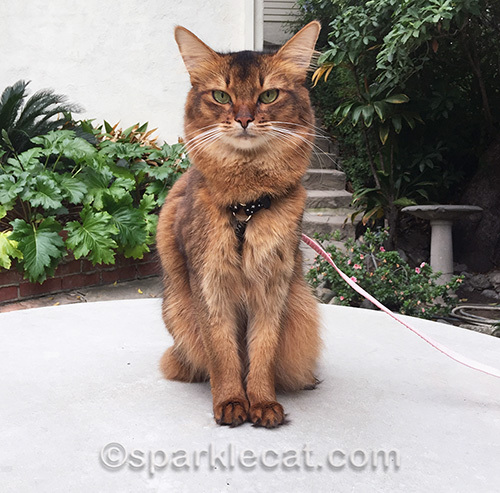 (In case you are wondering, it is an article she wrote about harness and leash training.) The photos are all of me, so it’s all good. It’ll be interesting to see if I win the Muse Medallion or if my human does! Which of us do you think will win? We are SO happy that a KITTY won a Certificate of Excellence for writing! It’s so great we are being recognized for our talent. Thanks for leading the way! P.S. We think you’re the winner. Concats and best of luck! Concats concats to you and your Mom Summer!!!! We believe you will win because you are so pawsome! You and your Mom are both excellent writers of course! I always knew you were a very talented cat. concats, Summer! we will echo “well deserved”! Summer, congratulations to you and your human! It’s hard to say who will win, but kitties and their points of view are awfully hard to resist. Congratulations, Summer! If the judges are cats, you’ll win paws down. If they are humans, it might be more of a toss-up: humans tend to favor each other. Well…we kind of already knew that, didn’t we? lol. Concats! One of these days I will decide to enter, I NEVER do……….I am more deeply entrenched in the advertising/branding part of cat writing (away from the blogging trenches, behind the scenes) and I am greatly enjoying it! Yes you are a great writer, Summer. Congrats on winning those certificates. Well done. Congrats pretty Summer! We are not surprised though, you are most excellent! Can we hope for a tie? 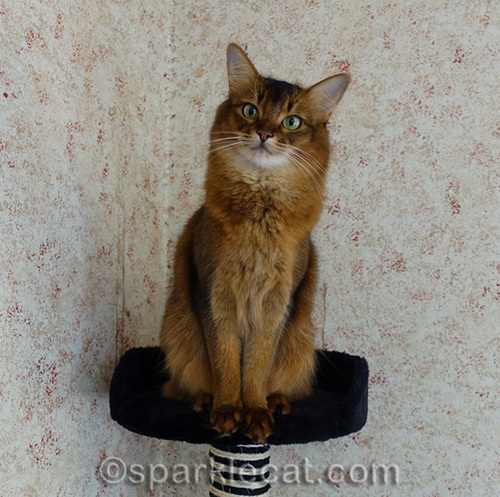 You look very intelligent, and Regal, sitting up there on your perch! Makes me want to kiss you on top of the head, and pet your warm soft fur! Congrats. I love your writing. Congratulations Summer! You are a clever girl. That’s fantastic Summer, many congratulations! Congratulations, Summer. We always knew you were a good cat writer. MY mom and I think it will be you Summer. She comes straight in with coffee and her plate of two eggs and sits here…you first. You are a great start to the day. We think you will because, well you are a CAT and we all know that cats are the most superior creatures on Earth. A mere mortal human couldn’t hope to compete with us. Congratulations! You are a very talented writer, Summer.